Posted 8:43 pm by Administrator & filed under News. Mayor Francis Slay and the St. Louis Development Corporation honored the Tower at ŌPOP as Development of the Year during the City of St. Louis Business Celebration Luncheon. The annual awards event, which recognized the best businesses and developments of 2014, was held on Friday, October 3rd, at the Renaissance Grand Hotel. The Development of the Year award recognizes projects that demonstrate a creative approach to development in the city and expand the market for city real estate. 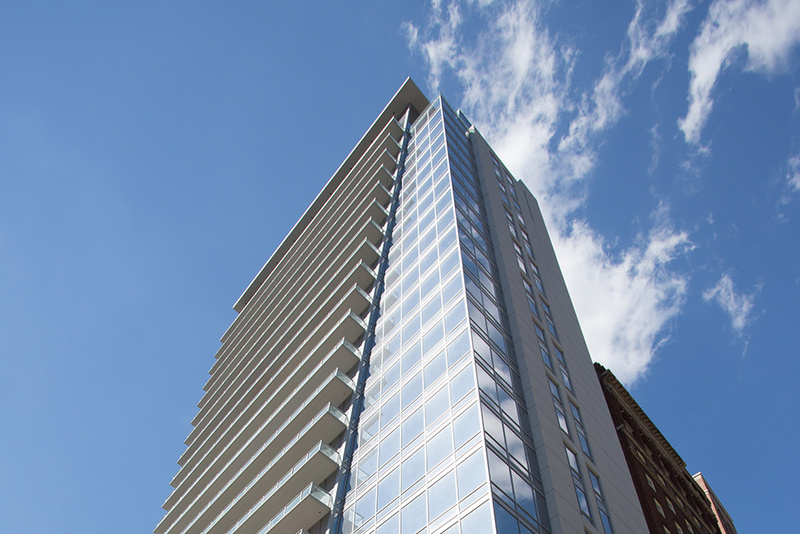 Located in the central business district at 411 N. 8th Street, the Tower at ŌPOP is the first new residential high-rise tower to open in downtown St. Louis since the 1960’s. HPA was retained by developer UrbanStreet Group to design the interior build-out of the 25-story concrete shell that was left unfinished for five years due to the economic downturn. The $22 million project features 128 luxury apartments with contemporary, condo-quality finishes, and expansive amenity areas, including a business lounge, fitness room and double-height clubroom and rooftop terrace with city views of the Gateway Arch. The Business Celebration Luncheon was launched in 2002 to honor the St. Louis business community. Click here to view the Mayor’s remarks and a complete list of honorees.